Elif Çavuşlu holds a B.A in Social and Political Sciences from Sabancı University. During her university years, she volunteered for Children of Hope, helping the rehabilitation process for homeless young people with addictions; for the Foundation for the Support of Women’s Work, working on their website and for Amnesty International, participating in various human rights campaigns. In 2007, she received the Jean Monnet Scholarship to study foreign and security policies of the European Union in the University of Warwick. She received her M.A. degree with a thesis entitled "ESDP and the EU’s changing security Identity: The Implications for Turkey". Currently, she is enrolled in the Political Science and International Relations M.A. 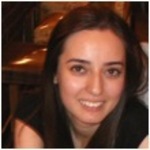 programme of Boğaziçi University and she works as a junior expert at the Turkish Ministry for EU Affairs.